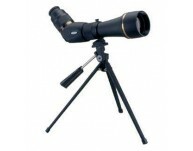 Spotting scopes are small telescopes generally used for daytime observation, birdwatchers or hunters wanting a good look on ridges for that elusive game. NOW INCLUDES A SMARTPHONE ADAPTER FOR DIGISCOPING! model: KONUSPOT-80 type: zoom pri..
Technical Information: Magnification: 20x-60x Zoom Objective Dia: 100mm Exit Pupil: 5mm at.. Objective Lens Diameter 60 mm Focal Length 13.1' / 4 m Field of View 16x: 2.6° - 136.2' @ 1000 yd ..
Key Features 82mm Objective Lens: An ideal balance of size and brightness. Ergonomic, Ligh..